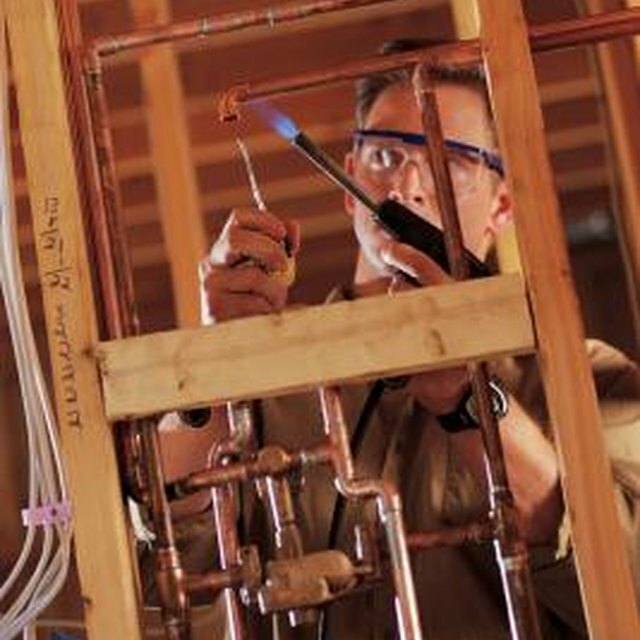 Copper drain lines were used in homes' plumbing systems before the advent of modern plastic pipes. Copper drain lines develop erosion problems similar to those of copper water supply lines. When a copper drain line needs repair, polyvinyl chloride (PVC) pipe and fittings can be used. Flexible rubber fittings allow you to transition from copper drain lines to PVC pipe. These fittings slide onto both pipes and are secured with stainless steel bands. When properly installed, these transition fittings seal waste water and sewer gases inside the drain system. PVC pipe is commonly used in home drain systems. Locate the hub -- an enlarged bell-shaped opening -- on the PVC tee where you'll be attaching the pipe and the fitting. Measure the depth of the hub on the PVC tee with a tape measure. Multiply the hub measurement by 2 and cut the PVC pipe to that length with a PVC saw. Deburr the end of the PVC pipe and the existing copper pipe with a deburring tool. Clean both the end of the PVC pipe that will be placed into the PVC tee and the inside of the receiving hub on the PVC tee with PVC pipe primer. Apply PVC cement over the primer on the pipe and on the inside of the PVC tee's hub. Fully insert the PVC pipe into the PVC fitting and rotate the pipe in the fitting one quarter-turn. Hold the pipe in the fitting for 30 seconds. Insert the flexible rubber transition fitting onto the copper pipe and PVC until fully seated. Tighten the hexhead screws with a 5-16 inch nut driver or screwdriver. Make sure that all cuts are square. Use a miter box to ensure square, if needed. Check with local plumbing inspectors for local code requirements. Use a PVC saw when cutting PVC. PVC saws make cleaner cuts than other types of saws and won't chip the plastic.